Notes: Jun. 1959←Jul. 1959→Aug. 1959 Vol. LXIII, No. 5. The cover art is credited to "Freas" but signed "Kelly Freas". Credits for interior art are given at the beginning of story text. Interior art credited to "Freas" is signed "Kelly Freas" on p. 8, & with his KF-circle logo on pp. 22 & 29. Interior art credited to "Martinez" is signed with a stylized "M" (except possibly on p. 135). The reviews on p. 148 are buried in an introductory section, titled "Catastrophes". The reviews of three books by Verne on p. 153 also list the publisher's series, "The Fitzroy Jules Verne". The reviews on pp. 157-158 are reprint notices with brief comments. 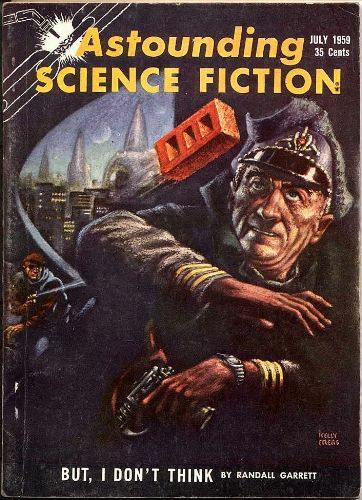 Editor Title: Astounding Science Fiction - 1959 • [Astounding / Analog (1937-1971)] • (1959) • edited by John W. Campbell, Jr.